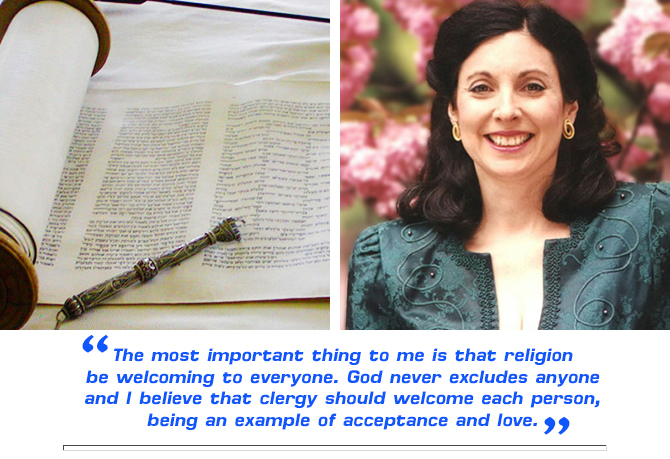 LBGT and interfaith weddings are nothing new or remarkable for Rabbi Jill. For over a decade, Jill Hausman, Rabbi and Cantor of The Actors' Temple in New York City (www.theactorstemple.org) has joyfully consecrated what some considered "out of the box" wedding ceremonies. 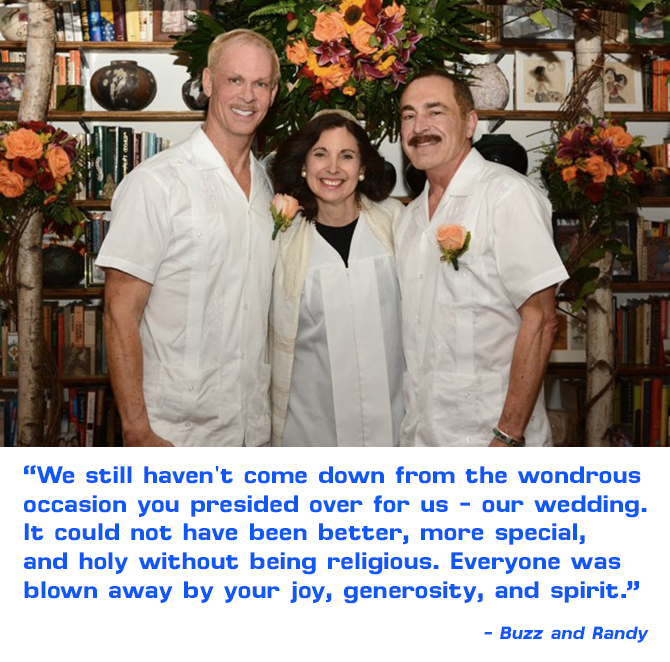 Any two people in love, whatever their gender or faith, have always found in Rabbi Hausman a loving and joyous officiant in a ceremony to be cherished and remembered for a lifetime. She will happily work together with you and your beloved to craft a ceremony that celebrates the beginning of your unique life journey together. Call Rabbi Hausman by phone at 212-865-4944 or email her to discuss and schedule your ceremony. Whether your wedding plans are big or small, traditional or contemporary, make your wedding a truly spiritual and joyous occasion. 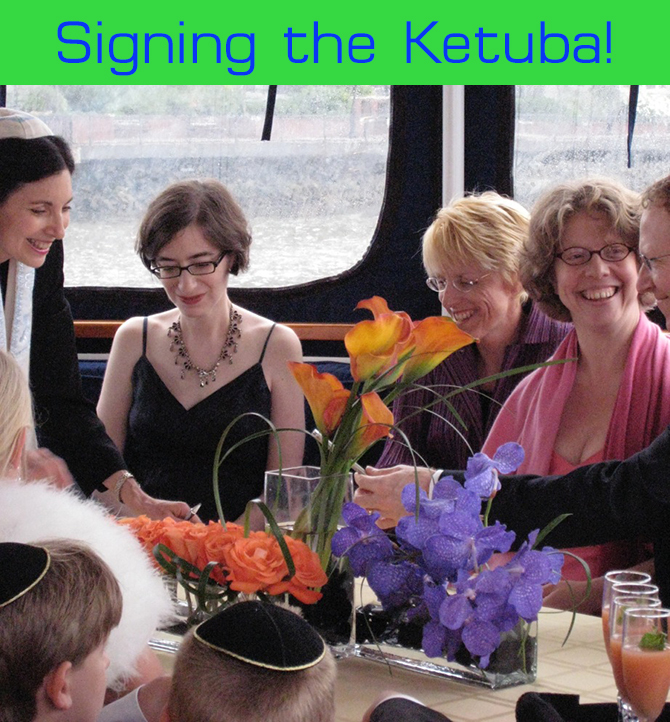 Rabbi Hausman will help you create the perfect ceremony. She is not just an ordained Rabbi, but also a Cantor, and her inspiring voice will bring a special joy to your unforgettable wedding. LGBT Jewish weddings, Jewish-Christian weddings, and all LGBT interfaith ceremonies with co-officiant clergy are Rabbi Hausman's specialty. Scores of couples across the spectrum of gender and faith have begun their married lives with a beautiful and inspiring ceremony conducted by Rabbi Jill Hausman. Please call Rabbi Hausman by phone at 212-865-4944 or email her at hausjill@aol.com to discuss and schedule your own unique ceremony. She looks forward to being your partner in a joyful celebration of your life together! 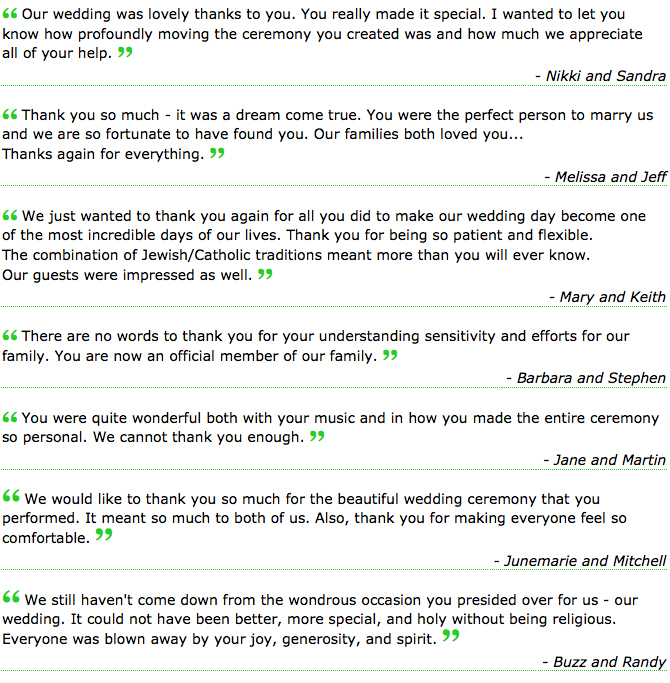 ...Thank you for making our wedding such a special and memorable event. EVERY single person at the reception had the most lovely things to say about and the wonderful ceremony you led. We appreciated your thoughtfulness, your warmth, and love and most of all your incredible energy that you brought to the day. …The ceremony was just beautiful and we were so pleased. Our friends and family can’t stop talking about what a beautiful ceremony it was. We are so thankful for you. Thank you for helping us to make such a lovely ceremony. It was so beautiful and was beyond everything we wanted. Rabbi Jill provides a lovely chuppah, or wedding canopy, free of charge. It consists of a choice of two white canopies or a red canopy trimmed in gold, and poles which extend up to 12 feet. Garlands of white flowers are wound around the poles. She has always been happy to marry LGBT couples. She specializes in interfaith and co-officiated LGBT weddings - Rabbi Jill has performed ceremonies with Christian, Hindu, Muslim, and Buddhist clergy. Rabbi Jill Hausman is the Rabbi and Cantor of The Actors’ Temple in New York City (www.theactorstemple.org). For twelve years, she served as Cantor and part time Rabbi of Boro Park Progressive Synagogue in Brooklyn, NY, a UAHC affiliated Reform congregation. She is both an ordained Rabbi and a Cantor. She has officiated at LGBT weddings, Jewish and Interfaith weddings, Baby Namings, B'ris, B'nei Mitzvah, and Memorial ceremonies in New York, New Jersey, Connecticut, Massachusetts, Rhode Island, Vermont, Pennsylvania, Washington, D.C., North and South Carolina, Georgia, Michigan, Minnesota, Quebec, Bermuda, Mexico, The Dominican Republic, and Peru.